Everyone knows Bernie Sanders hates the big banks. But now he's blasting iconic American giant General Electric as a greedy company that's "destroying the moral fabric" of the country. 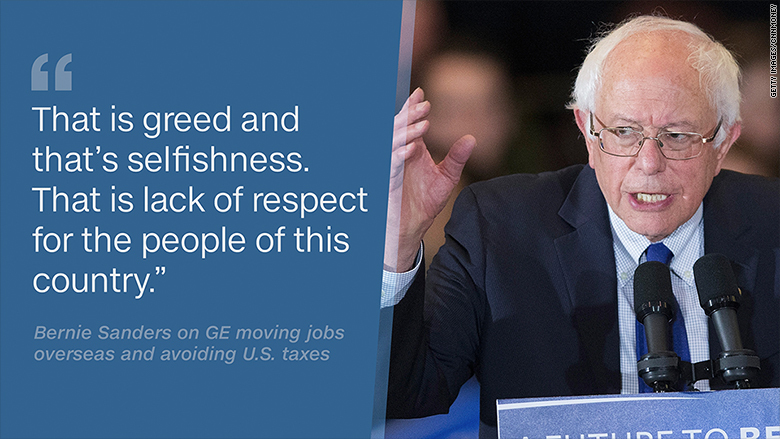 Sanders called out GE (GE) for shipping jobs to Mexico, shutting down American factories and working hard to minimize its tax bill. "That is greed and that's selfishness. That is lack of respect for the people of this country," the Democratic presidential candidate told the New York Daily News editorial board late last week, according to a transcript posted on Monday. Sanders was responding to a request for specific examples of the kinds of corporate greed he's railed against in speeches as destroying the fabric of America. GE was the only company Sanders named, other than traditional banks. "General Electric was created in this country by American workers and American consumers," Sanders said. "What we have seen over the many years is shutting down of many major plants in this country, sending jobs to low-wage countries." 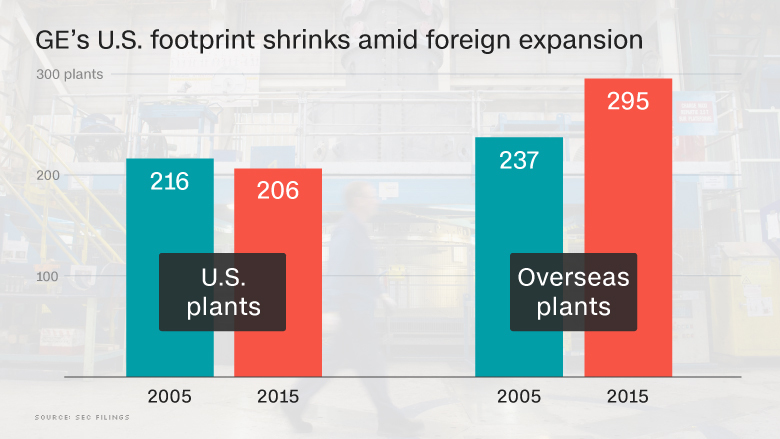 A CNNMoney analysis shows how GE's U.S. footprint has indeed shrunk dramatically over the past two decades. Back in 1995, roughly 68% of GE's 222,000 total employees were in the U.S, according to its filings with the Securities and Exchange Commission. 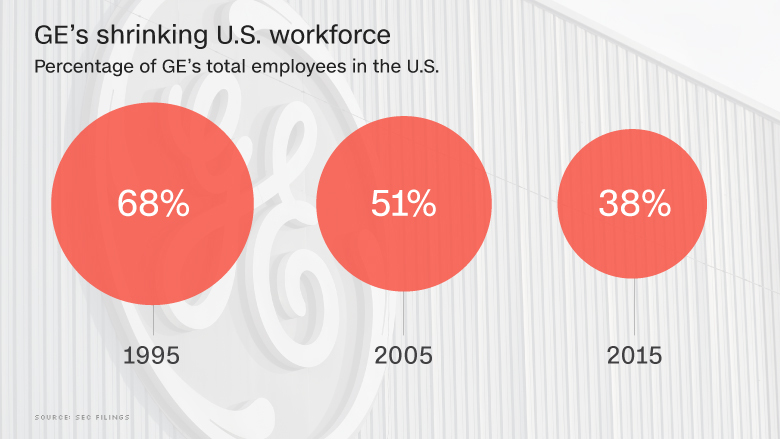 By 2005, the percentage of American jobs declined to 51% and by the end of 2015, just 38% of its employees were in the U.S.
GE's total global workforce has increased to 333,000. But it employs fewer American workers today -- 125,000 versus 161,000 in 2005. A glance at GE's factories tells a similar story -- that a majority of its expansion has happened overseas. GE has 10 fewer U.S. plants today than a decade ago. But the number of factories overseas has risen by 58. While it used to be split about evenly, today 59% of GE's plants are on foreign soil. GE did not respond to a request for comment from CNNMoney. Sanders said that companies need to care about more than just profits. "If the only thing that matters to you is making an extra buck, you don't care about my family. I think that's immoral," Sanders said. "And I think what corporate America has shown us in the last number of years, what Wall Street has shown us, the only thing that matters is their profits and their money. And the hell with the rest of the people of this country." To be sure, GE is not the only multinational company moving jobs overseas. Fast-growing economies and cheaper sources of labor in India, Mexico, China and other countries have attracted tons of foreign investment by major U.S. companies. As CNNMoney previously reported, the U.S. has lost 5 million manufacturing jobs since 2000. Interestingly, Sanders drew a distinction between GE and Apple (AAPL), a company that Donald Trump has criticized for making gadgets overseas. Sanders said Apple is "not destroying the fabric of America," though he wishes Apple would make some of its devices in the U.S. instead of China. Sanders is right in that plenty of Chinese companies make Apple parts. However, Apple claims it works with 8,000 different U.S. suppliers from 31 states for its products. Apple estimates its products and innovations have led to almost 2 million U.S. jobs. Of course, it wouldn't be a Bernie Sanders tirade without slamming the big banks he's promised to dismantle if elected. Sanders said JPMorgan Chase (JPM) "and virtually every other major bank in this country" are destroying the national fabric. "There are still millions of people in this country who are suffering the results of the greed, recklessness and illegal behavior on Wall Street," said Sanders. Sanders added that he believes that "to a significant degree" Wall Street's business model is "fraud." He pointed to the pre-crisis practice of bundling toxic mortgages with good ones and selling those securities to investors. Sanders said big fines paid by the likes of Goldman Sachs (GS) suggest illegal activities took place -- even though no Wall Street executives were prosecuted for the financial crisis. "I think an aggressive attorney general would have found illegal activity," Sanders said. Editor's note: An earlier version of this story indicated Sanders wished Apple would make "more" of its devices in the U.S. He actually said "some."